It works by applying the Firespitter FSfuelSwitch module via ModuleManager to all stock tanks. This is a non-destructive method of modifying stock configs that is completely revertible by simply uninstalling the files provided by this mod. Config code is written by veryinky, Badsector and Nertea. Okay, now you're killin me man. Was on my way to get Atomic Age, partly just for this. It's like Oprah up in this joint these days...YOU get a fuel switcher, YOU get a fuel switcher, YOU get a fuel switcher! (EDIT) One quick note, I see this is the original Atomic Age cfg file, after looking into fuel switchers for a while, it's the general consensus that LF and OX are both the same density, so...if you have the jumbo64 tank that holds 6400 units total of LF/OX, if you remove the OX, then you will have 6400 units of LF, and vice-versa. I had been assuming that you just double the original amount like your cfg file does, but it appears this is not the case. You say that the download contains Module Manager, but it is not there.. Slight oversight? Wil this apply to all mod tanks as well or rather, how do I have it apply to all mod tanks as well? After briefly digging through the mm patch, he's not blanket applying this to any tank containing both LF and Ox, just the stock tanks. Being fair, thats probably smart because, for example, some Near Future Spacecraft fuel tanks have LF, Ox, and MP in them & applying this to them would strip the monoprop, which I very much depend on at times. Being fair, thats probably smart because, for example, some Near Future Spacecraft fuel tanks have LF, Ox, and MP in them & applying this to them would strip the monoprop, which I very much depend on at times. You can target the MM patch to ignore the tanks with monoprop easily enough. Thats how Nertea's Cryo Engine & Interstellar Fuel Switch patch works. @Porkjet : You may want to put an advisory in your post that this will not play well with Nertea's Cryo Engine Pack. It also applies a global patch to all tanks that contain an LFO mix, though dynamically instead of by part so it catches mod parts, but you both are targetting the same conditions. So whichever one gets applied first causes the other to be ignored. Leave it to porkjet!!!! Instant permamod!! not sure what you mean, It's the 0.9/1.1 LFO mixture used by stock engines. It uses InterstellarFuelSwitch, which is an extended version of the FS switch. If this were stock, it could be a tier 3 unlockable for the VAB/SPH. Which should I be using, this or InterstellarFuelSwitch? Can I use both? Using both is a bad idea. Whichever patch gets applied first will be the one that shows up (which might leave Nertea's engines without a fuel source). Both patches target the LF & O resources on the ship and then remove them after the patch is applied, so when the next patch runs there is no LF & O Resources for it to find. 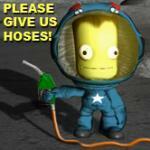 So it really depends on if you want the LH2 fuel options (and Nertea's engines) or not. hmm, it is not showing up in the VAB for me? The man, it's you. This should be stock. So far almost everything his done ended up that way. Are we rooting for this to follow suit? Just to let you know, I installed this mod with a career save already in progress and found that, while the mod worked fine, all my existing ships in space had had their stock LF/O tanks magically refilled. (Admittedly, better than having them magically emptied!) Uninstalling did not fix the problem, reverting to a previous save did (fortunately I make hard saves all the time so it looks like I'll only have to repeat one routine SSTO launch). I can't think of a way around this short of manually editing the save file, which unfortunately seems like more trouble than it's worth seeing how many ships I'd have to edit. Great mod in any case, I will definitely reinstall it next time I start a new save. May actually end up starting a new save partly so I can use this mod, in fact, perfect solution for the LV-N LF tank problem! I actually had this problem as well, but I *think* it also happened with a ship I launched after installing the mod. I was fiddling with modulemanager to get this to play nice with GPOSpeedFuelPumps, so may have triggered it that way. It's a thing. I've found this out after switching fuel switchers lately looking for one I liked best. The MM patch goes through and does it thing when you start the game, and as a result *every* time you change fuelswitchers, existing tanks get reset. I'm guessing they get switched to whatever parameters are listed first in the switchers cfg file, which most of the time is the default tank setting.